Name.com only offers shared hosting at this time. Shared hosting means that there are multiple customers on a server who shares the space, resources and IP address. While we do not offer dedicated hosting, we do offer Dedicated IP's which is added as an additional service to your existing setup. A Dedicated IP is not required when installing SSL certificates on Name.com hosting. Click on your web hosting account under the Hosting-tab. 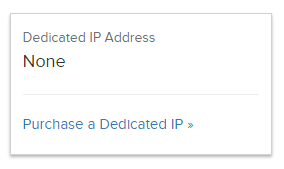 On the Web Hosting Dashboard, click the link to Purchase a Dedicated IP. This will add the product to your cart. Proceed to checkout to pay for the service and it will automatically apply and correct the DNS upon completion. Note: The Dedicated IP will go in effect upon completion and the DNS will be automatically adjusted if you use our nameservers. If you do not use our nameservers then you need to manually update the DNS records to reflect the new IP.